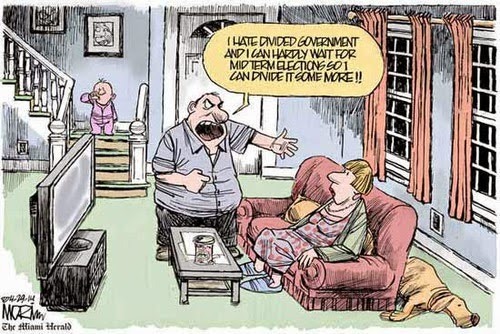 The Dividist Papers: Who Debt? Obama Debt! The Center on Budget and Policy Priorities recently updated their analysis of the underlying causes of our debt and deficit problems. Their key findings are summarized in these two charts. 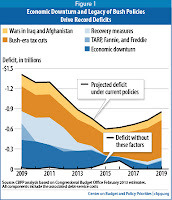 "Just two policies dating from the Bush Administration — tax cuts and the wars in Iraq and Afghanistan — accounted for over $500 billion of the deficit in 2009 and will account for nearly $6 trillion in deficits in 2009 through 2019 (including associated debt-service costs of $1.4 trillion). By 2019, we estimate that these two policies will account for almost half — over $8 trillion — of the $17 trillion in debt that will be owed under current policies. (See Figure 2.)" 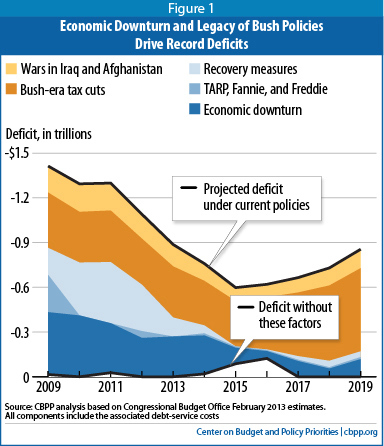 In fact, the CBPP project the debt and deficits will continue to be George W. Bush's fault for as far as the chart can see - throughout President Obama's second term, through the next president's first term, to 2019 and beyond. Before we take a look under the covers, it's worth reviewing the history of their thesis. In 2010 it became important for Democratic strategists to explain to the electorate that exploding federal spending and the consequent mushrooming deficits and debt were really not the fault of the unified democratic rule in place since the 2008 election. 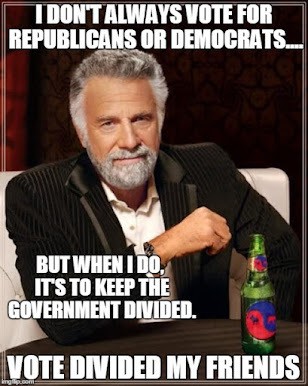 Voters were laboring under the mistaken impression that two trillion dollars of new spending passed in just two legislative acts ( Porkulus and Obamacare) on purely partisan votes in only two years of one party democratic rule might have had something to do with it. Au contraire mon ami. The bones of this CBPP analysis were initially unveiled three years ago in February 2010, shortly after passage of Obamacare. The first version of the above charts made an appearance in an updated analysis in June that same year. Post mid-term election the GOP took control of the House restoring divided government and in 2011 the CBPP updated the analysis again. Variations of this analysis were picked up by MSM, embraced by the left-o-sphere and used as ammunition for the "Grand Bargain" negotiation. The same negotiation that ultimately failed and spawned the bipartisan "sequester" cuts just implemented. "Let’s think this through – the basis for the chart is that all costs for all time are attributable to a new policy that is enacted during the term of that president. Okay…Then how about we add a bar for FDR and load 70 years or so of total Social Security costs to this chart exclusively under his name? Or how about Truman who must bear the burden of all costs for maintaining US Troops in Korea for the last sixty years, and I guess Europe too with the Marshall Plan and NATO. Then we can move on to LBJ who gets all of the accumulated fifty years of costs for food stamps, welfare, medicare, and medicaid. Stack these three up, and neither GWB or OHB will show up as a rounding error. Now that I think about it, a standing army was a new policy enacted by George Washington – Once we pile up 200+ years of defense spending on George, I guess we finally have tracked down the real culprit for our deficit and insane spending." Dubious premise notwithstanding, as noted above the CBPP published the same argument yet again last week. They are still calling the tax cuts and war expenses a "Bush Legacy" and attributing most of our current and future debt and deficit to Bush. But the world has changed and policy has changed since they started publishing this thesis three years ago. Simply stated, they are not acknowledging the facts in their graphic presentation. The argument itself, the dubious premise - those are exactly the same as when first presented three years ago. What has changed are the facts about ownership of the policies they are tracking. And by ignoring these facts, the CBPP has moved from a dubious, "disingenuous" argument to outright misrepresentation and falsehood. The Bush Tax Cuts were never permanent. They had a sunset provision that expired in December 2010. In 2010 they were extended unchanged for two years over President Obama's objection. Let's be generous and call those two additional years Bush Legacy Tax Cuts. But on December 31, 2012 those tax cuts and that law and that legacy expired. It was replaced by new policy and new law that was strong-armed through Congress by President Obama. President Obama promoted, fought for and signed this new policy into law. He took full credit and praised this new permanent policy of tax cuts for the 98%. His supporters insist that the cuts should be know for all time as the Obama Tax Cuts. The Bush Tax Cuts are dead. Long Live the Obama Tax Cuts. The Center on Budget and Policy is promoting a lie. In December 2008 President George W. Bush signed an agreement with Iraq to withdraw all U.S. combat troops by the end of 2011. President Obama honored and executed that agreement. Iraq was a Bush Policy. The costs were a Bush legacy. But that policy and legacy ended with the agreement to withdrawal in 2011 signed by George W. Bush. The Iraq War was a mistake. The Bush administration negotiated our exit before he left office. Obama executed that agreed exit. As a consequence Iraq is not driving our debt and deficit anymore. Candidate Obama campaigned on expanding our military presence in Afghanistan. As President he "surged" and expanded the scope of that war far beyond anything envisioned or intended by the Bush administration. Whether that decision was right or wrong remains to be seen. Regardless, it was a new policy that extended and expanded our military commitment in Afghanistan. Hence, our Afghanistan policy is Barack Obama's policy and not George W. Bush's policy. The cost of our continuing expanded presence in Afghanistan belongs exclusively to the Obama administration. To use one or our president's favorite phrases - Let me be clear. 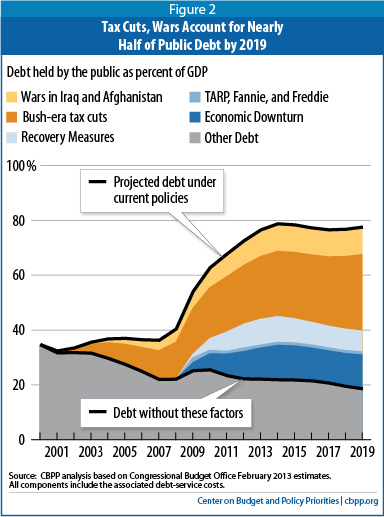 Legacy Bush policies no longer are a meaningful contribution to our debt or deficit. Our deficit is driven by Obama administration policy. Our debt is driven by Obama administration policy. If there was any question before, it does not exist now. President Obama's policy is primarily responsible for, has significantly contributed to, and is the primary reason for the debt and deficit problem our country faces. The legacy of the Obama administration will be the debt and deficit he leaves behind. He still has time to fix it. A Grand Bargain negotiated in the next 30 days may be his last best chance. CBPP is a bunch of partisan propaganda hacks. I expect nothing but twisted info from them, and they never disappoint.